Day 142: Rain, Rain, Go Away! Although it rained on and off throughout the night, it never got very heavy which was fortunate for me. I’m positive that if it was, water would have flooded into my tent because it was set up on a slope after all! While I ate my breakfast, the other hiker headed out, giving me a few minutes to myself. I headed back up to the trail in the mist, climbing towards Deception Lake. I didn’t see anywhere to camp until the trail turned and climbed away. There, I saw a nice campsite underneath some trees. I guess that is where the guy that passed by last night stayed. Soon, I saw my campsite companion just ahead. He would stop for several seconds, see me coming, and then start climbing again. Once I caught up to him, I finally learned that his name was Nick. I asked him if the mice had bothered him last night and he said that one had run into his tent! I had been envious of his more solid looking shelter, but after he told me that, I felt more satisfied with my own! I asked him how it got in and he said that he had left one of the zippers partially open! The rain started coming down again. He let me go on ahead as I was stronger on the climbs, but caught back up once I stopped to take a snack break under a tree on the descent. I passed by two hikers headed in the opposite direction who said the rain was supposed to clear out in the afternoon! They both seemed in much better spirits than I was! I kept looking at my watch, wondering if it was after twelve yet. The next climb was even steeper than the previous one! I was not happy! I passed Nick on the way up again and said, “This grade was not made for horses!”. I didn’t understand how a horse could make it up that! I felt completely drained. The descent was also slow going because the trail was now a water trough or very slippery from the mud! Every step was taking triple the energy! I let Nick go ahead of me again. He was the one non-thruhiker who was able to keep up with me for an extended period of time. We now had two short climbs and two decent ones left. Several mile later, I needed to stop to take another snack break. Nick stopped, too, although he didn’t eat anything. I guess he wanted to stay with me. We’re both quiet people and don’t speak loudly, so together, our conversations consisted of a lot of “What’s?”. “What did you say?”. He said that I was only the second person on this hike that actually talked to him. The first was Mark, the guy that I met on the bridge, admiring the waterfall. He chatted with Nick for about 10 minutes and was very pleasant. I asked him if he had seen the grumpy one. It turned out that he got the same reaction from him! I asked him if people had been asking him if he was hiking the PCT. He was definitely skinny enough to be a thru-hiker! They had, and when he said no, they didn’t have much else to say. I felt bad for him. He had started at Snoqualmie very early in the morning on the day that I had started. He said he was interested in doing the next stretch of the PCT, but that it was too long to do alone. A friend of his had agreed to hike back from Stevens Pass yesterday and meet him to camp and then return to Stevens Pass today, but he had yet to see him. Neither one of us had had any reception for this entire stretch so he didn’t know if he had left a message. A short while later, we ran into another couple. “Are you thru-hikers?”. I said I was and thereafter, they only spoke to me. I felt even more sorry for Nick. I suggested that maybe he just pretend for the day, but he said it was fine. No one owed him anything. I told him that I was feeling like a CDT hiker that I had met on the Colorado Trail. Now that I think about it, he couldn’t have been thru-hiking the trail, but when I met him, he said he had 200 miles left. He seemed very down. His calf was hurting and 200 miles seemed a long way to go to him. Here I was in a similar position. I had less than 10% of the trail left, but I felt exhausted, my knee was hurting, I was still sick, and I was tired of being in the rain. I felt like I should have been more positive. I wasn’t making thru-hiking look like an enjoyable thing to do! We started the final climb of the day and ran into another young, happy couple who were headed the opposite way. The girl had a bear bell attached to her pole. I had seen several Washington hikers with these and wondered what the point was. To me, the jingling sound with every step was incredibly annoying! The guy asked if it was as foggy in the forest as it was up here. I said it was. We commented on the supposed clearing up and wished each other well. Although the rain had picked up in intensity and I wanted to reach the top of the climb, I was running out of energy and needed another snack break. I told Nick that he could go on, but he stopped with me, and then got out his stove. “Are you cooking something?”. He told me that he purified his water by boiling it. In this weather, he didn’t mind drinking warm water. Once I was satisfied with my snacking, I looked down to see my wet stuff sacks. Wonderful. We hoisted our packs and headed on. At the top of the mountain was a ski lift, which, in the fog, was an eerie sight. We headed down the other side, and reentered the forest. These last miles were so tiring! We had heard that there was a cycling race going on today and that it would probably be easy to catch a ride into town. I started imagining eating a nice warm meal at a restaurant and then getting a room at the Cascadia Inn. After awhile, I asked Nick if he had hiked this section before. He said he had. Then I felt I could ask the question that wasn’t leaving my mind. “Are we almost there yet?”. He said we were. Before I knew it, I could see buildings! And something that looked like a clock tower. Maybe we could stay there! As we got closer, I saw mountain bikers and a guy hosing off a bike. “I need a hose!” I said. I needed to get that dirt off my tent zippers! And my rain pants were now covered in mud. We followed the switchbacks down to a parking lot, where several tents were set up. We walked by a few people sitting around, but no one said anything to us. Then, we saw some restrooms. A guy named Maverick introduced himself. He was thru-hiking with his son and told us that we could get burgers at one of the buildings in the resort. The rain was still coming down. I asked Nick what he wanted to do. I felt like I wanted to get to my stopping point and warm up more than get a potentially free hamburger, so we headed to the highway to try hitching. Nick wanted to get back home to Everett, which was the same direction as I was heading, but further away. Unfortunately, we were on the wrong side of the highway. We decided to wait and see if anyone leaving the cycling event might be able to give us a ride. Unfortunately, they all seemed to be headed the other way! We decided to split up to double our chances. He would wait here for someone leaving the event, and I would walk across the bridge to the other side of the highway. Before I got to the road, I saw a car and waved it down. Unfortunately, there was only room for one, so I told them never mind. It turned out they weren’t going that way anyway. I walked down to the highway and stuck out my thumb. Car after car careened by. Not one slowed down. This was not going to be so easy! After quite awhile, a car horn beeped and I realized that someone had stopped for me, but I hadn’t noticed. I ran up to the van and the man asked where I was going. Meanwhile, Nick was talking to a driver on the other side of the highway. I couldn’t figure out what was happening. Did he already have a ride for us? I told the van driver that I might not need one after all and yelled over to Nick. He yelled something back and I figured I was all set. I told the van driver that I didn’t need him after all, but thanked him for stopping. Then, I saw Nick holding up a finger. “He only has room for one” he called out. Are you kidding me? The car pulled out onto the highway and swerved past me without even a look from Nick or the driver. Not cool, buddy! Not cool! I just gave up a sure ride in a nice, warm, spacious van and now I was left to stand in the rain again for who knew how long! I thought we were working as a team to help each other out! I wouldn’t have accepted a ride if there was only room for me! A little while later, a car stopped. It was a woman driver and she opened up her trunk and let me put my pack in. Everything turned out to be fine. She said she could tell right away that I was a nice person and she felt comfortable stopping. We talked about my reasons for hiking the PCT and then talked about her work as a therapist. I asked to be dropped off at the Cascadia Inn, although my resupply boxes were sent to the Dinsmores. I felt like I wanted to get some food, and get dry and cozy, and tomorrow I could worry about getting my boxes. Before she left, she said she wanted to tell me that I was the first hitchhiker that she had picked up in 25 years! I went inside, and found no one at the checkout desk. After waiting around for awhile, I finally went into the restaurant and found the owner there. He checked his book for room availability. He didn’t have anymore private ones left, so I decided to call the Dinsmores and see what she recommended. She laughed when I told her my name because Ham had called her several times about making sure my box was safe and kept in her actual house, as it had my passport in it. “Your mother is funny,” she said. I told her that wasn’t my mother. She said I should come stay with them and when I asked if I should hitch to their place, told me that she could pick me up in 45 minutes, which would give me a chance to get some dinner. All of my clothes were now wet and I was freezing cold. I ordered some tea and soup along with a burger. The people at the table near mine started chatting with me and were very impressed when they found out what I was doing. Later, Purple Haze came down from his room and sat at the table next to me. He was talking about how he had escaped most of the rain and that it wasn’t so bad. I, on the other hand, was not so lucky! I kept looking at my watch and trying to flag down the waitress so I could pay my bill, but she was now busy taking orders. Andrea arrived and had to wait a few minutes, but she found some hikers to talk to. We then headed back to the hiker dorm. 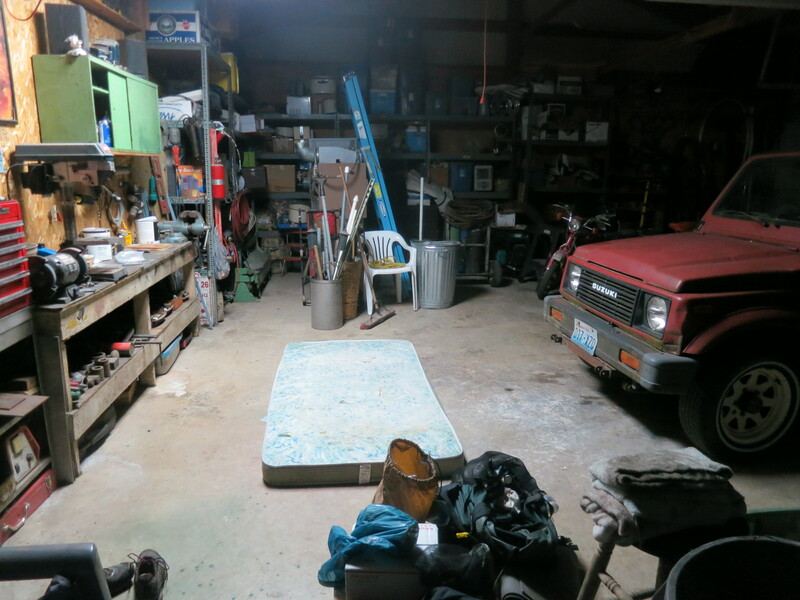 It seemed that all of the bunks in the garage were taken, so she said I could stay in the mechanic shop, where all of the resupply boxes were being kept. That way, I could have my own girl area. She let me take a shower and I gave her a pile of my dirty clothes to wash. On the way back to the garage, I ran into Ole, Veggie, and TrackMeat! “Wendy! What are you doing here?!”. 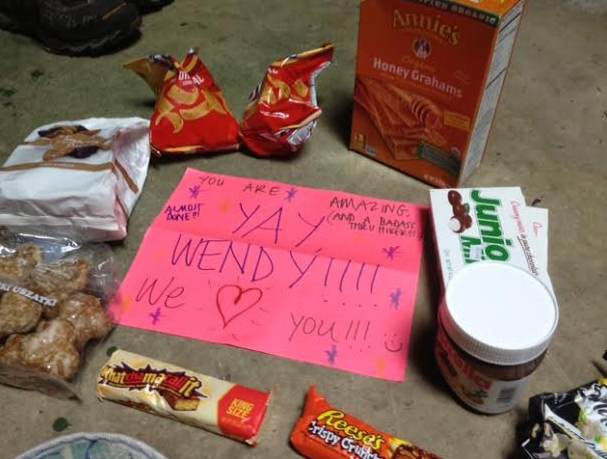 ritos, cookies, a small jar of Nutella, and some graham crackers. They came through! I also got a nice note of encouragement. I looked around at my surroundings and thought that this was probably the most grimy place that I had stayed, but I knew it was only for a night. I could hear the guys watching movies in the bunkroom, and was thankful that at least I had my own area where I had some privacy and would hopefully be able to get a little more rest. As I closed my eyes, a horn blared as a train sped across the tracks on the next road over. It shook the doors of the garage. 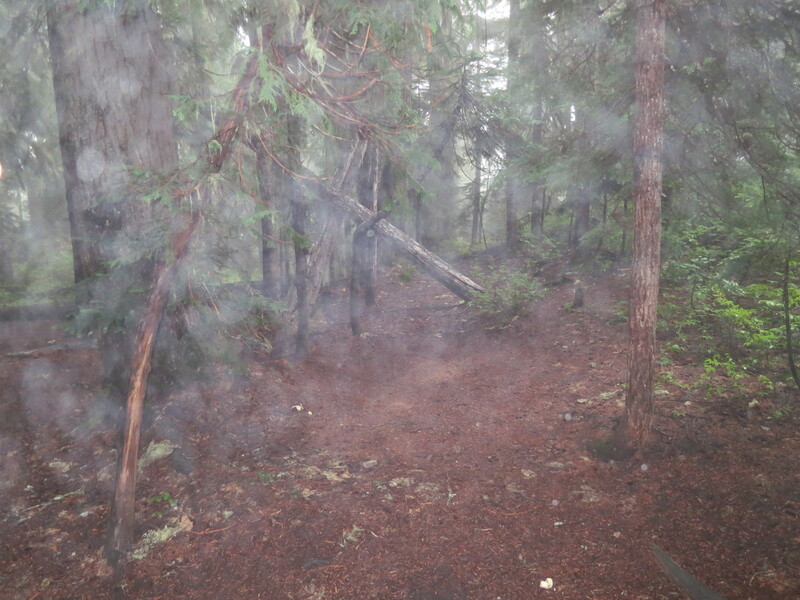 This entry was posted in Uncategorized and tagged Pacific Crest Trail, PCT 2013 blog, rain, Washington by Wendy. Bookmark the permalink.